This is one of the few images from the 17th century that offer a picture of quotidian activities—in this case, ones of considerable importance to the economy of the Americas. 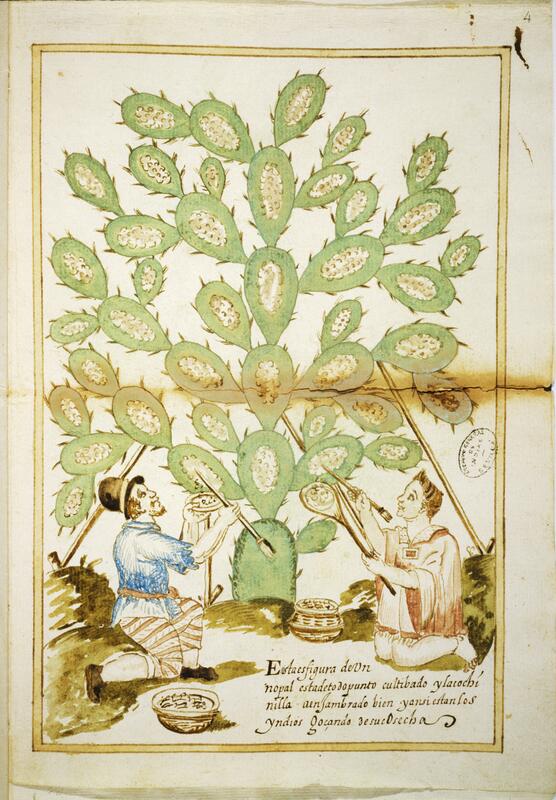 In this hand-drawn picture, an indigenous man and woman are shown harvesting cochineal, a parasitic insect that was used to make a brilliant cherry-red dye. This New World product was highly prized in Europe. The name of the painter that made this work is not known. However, the work itself shows both skill in composition and first-hand knowledge of cochineal production. The work is hand drawn on paper, and it measures 28.8 x 21 cm (ca. 11 x 8 inches). The picture, now in the Archivo General de Indias, is part of a short account by don Antonio de Figueroa, the governor of Yucatán in New Spain, written and addressed to King Philip III. His account of cochineal production describes the steps Figueroa had already taken to introduce cochineal to the Yucatán from Tlaxcala, the center of cochineal production in New Spain. This document seems to have been part of a larger attempt to spread the cultivation of cochineal across Spain’s colonies, including parts of Venezuela. 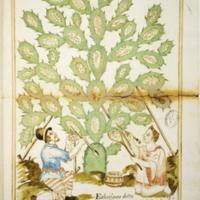 The demand for cochineal in Europe and Asia made it an incredibly valuable New World product. This image offers a window onto the role of indigenous people in that international economy. Cochineal production was largely in the hands of indigenous communities, who had mastered the agricultural technology needed to raise the insects. But since this cherry-red dye was a product for the European market, Spanish-run export companies could control its price, and they, not its producers, kept the lion’s share of profits. Cervantes, Mayán. 2004. La grana cochinilla del nopal: patrimonio cultural y propuesta económica. Mexico City: Escuela Nacional de Antropología e Historia and CONACULTA. Hamann, Byron. 2010. "The Mirrors of Las Meninas: Cochineal, SIlver and Clay." Art Bulletin XCII (1-2): 6-35. Rubio Sánchez, Manuel. 1994. Historial del cultívo de la grana o cochínílla en Guatemala. Guatemala City: Tip. Nacional.